Uthai Treesucon & Wich'yanan Limparungpatthanakij 2018. Lynx Edicions, Barcelona. ISBN-13: 978-84-16728-09-1. Hardback, 452 pp. Price: €54,95. Does the world need another field guide for Thai birds? As long as it adds something to existing books: sure! Lynx Edicions keeps on exploring new markets. Since the completion of their mammoth work Handbook of the Birds of the World they launched a successful digital version (HWB Alive), as well as the Internet Bird Collection (IBC). Now, they more and more seem to find their way into the field guide market. With the recent guides to the Indonesian Archipelago and New Guinea, a high standard was set. With all species already covered in HBW a new guide needs relatively few new plates. Since artwork is both time and money consuming, this gives Lynx a huge advantage over other parties working on field guides. The new artwork that is made for their field guides on the other hand further improves HBW Alive, which results in a constant cross-pollination of their products. The plates do at times give me the “yeah, I already knew that one” sense, but hey, it makes perfect sense to recycle what's already good. Birds of Thailand by Treesucon & Limparungpatthanakij is the latest addition to the Lynx field guide series. Completely uncovered areas are nowadays hard to find, and even poorly covered areas are getting scarce. Thai birds were however already covered in several well-established books from eg Boonsong Lekagul & Phil Round (1991) and Craig Robson (first published in 2002) as well as in older books, or guides that cover all of or other parts of Southeast Asia. While Lekagul and Round's guide was ground-breaking at the time, it is now outdated – though up to this date it still has a fair share of fans. It seems fair though to compare the new Lynx guide with Robson, since this is the most often used book at the moment. This guide is a co-production with Birdlife International. The cover (therefore?) differs from previous Lynx guides. The close-up of that Kung Fu style chicken (also known as male Siamese Fireback, one of the country's finest birds) on the front is just brilliant! And, oddly enough, the orange supporting colour works well. With the cover they already score a goal before I even open the book. On the inside the layout is similar to their previous field guides, which works well in the field. Species accounts are on the left, plates and maps on the right, so everything you need is right there together. There's no visual overkill, which makes for pleasant reading and browsing. What the collaboration between Lynx and BirdLife exactly means, is nowhere explained in the 15 pages short introduction. The conservation notes include a list of all threatened species and the threats they face: it’s the one clear BirdLife mark I found, though this also featured in the New Guinea guide they made without them! The taxonomy hardly gets any attention (it did in the Indonesian and New Guinea guides) and is basically restricted to a reference to HBW/ Tobias. 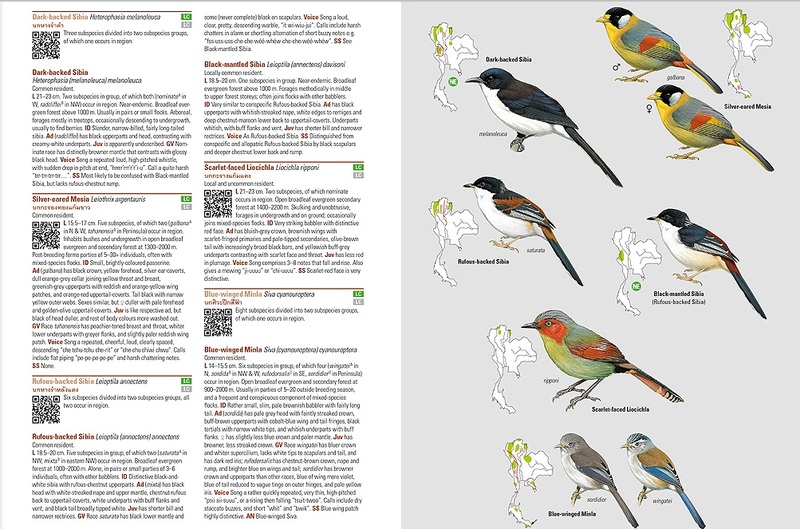 The nearly six pages long section on birding in Thailand that includes hotspots, a map and key species per site is much appreciated. More on that later. Every field guide is judged on its plates. Robson wins on quantity. I checked ten randomly chosen species and found that three had the same amount of plates, whereas seven species have less plates than in Robson (a random example: Treesucon & Limparungpatthanakij have one for Common Myna, Robson has three). So given this small sample is representative – it had my initial impression confirmed, so I believe it is – Robson has far more plates on offer. The new guide however wins on quality: in general the plates are better. The quality in Robson is, IMHO, somewhat variable, while the general standard in this book is high. I'll however keep on moaning (as in previous reviews) that every single swift(let) species needs plates of both the upper and underparts until Lynx finally produces new artwork! This is a difficult group for visiting birders, and it needs the best artwork possible. My copy is a trifle brighter than my Birds of the Indonesian Archipelago, which results in a much better colour setting that I’m happy with. In his review for ThaiBirding.com Nick Upton mentions that the differences between the bulbuls are over-emphasized. On the whole though it’s no a secret that I absolutely like the plates! Though I'm not the biggest HBW taxonomy fan, it's definitely more updated than in the other guides on Thailand. The most eye-catching decisions in this department concern the (former) endemics. With Siamese Partridge now a subspecies of Chestnut-headed and Deignan’s Babbler even considered invalid (conspecific with nominate ssp. of Rufous-fronted Babbler) it loses two out of three of its ‘classic’ endemics (the third being the probably extinct White-eyed River Martin). Both have always been much debated, so it’s interesting to see that IOC (still) recognizes these two taxa as valid species. Two splits however result in ‘new’ endemics. Turquoise-throated Barbet is a now widely established split from Blue-throated: it’s also adopted by IOC and Clements. The Limestone Wren-babbler split however, is not. Of the newly split Greyish and Rufous Limestone-babblers – that both occur in Thailand – the latter is now an endemic species. For those who have visited Thailand: you've probably seen the endemic. I like that all known Thai taxa are mentioned in the text, and that some plates show more than one taxon. The taxonomical notes, also on recent splits, are short but clarifying. I like that potential splits are mentioned between brackets under the more well-known “mother species”, eg Siberian Thrush also shows the Sakhalin Thrush Geokichla (sibirica) davisoni. And there's Rufous-backed, but also Black-mantled Sibia Leioptila (annectens) davisoni. Some of these choices did raise my eyebrows, like a potential three-way Long-tailed Shrike split. Or the Mandelli's Leaf-warbler that is presented as a possible split from Hume's Leaf-warbler, while the, as far as I know, main source on this matter (Irwin et al 2001) states that they are best regarded as subspecies. It is by the way remarkable that the related Yellow-browed and Mandelli's are not treated on the same page (nor are Radde's and Dusky, for instance). Whether these separately treated taxa will be split in the future is only of interest for those who mainly focus on numbers. For those interested in diversity itself it's fantastic that these well-defined taxa get their own accounts, plates and maps. Just brilliant! IMHO this is one of the best features of the book. It's good to see that Blue-winged Minla has regained its old name and that Blue-winged Siva – a name I never got used to – has fallen out of grace. Apparently I'm an old-fashioned kinda guy! Even better: the alternative names can also be found in the index, as do the popular names of the potential splits. This really helps finding the species you're looking for. The accounts are to the point in a style I like. Of ten randomly chosen species I couldn’t find any clear differences with Robson: both are authoritative, though (possible) splits now of course receive more attention. A bonus feature is all accounts have a QR code that directly takes your smartphone to IBC-pictures of the species. Handy if you are still in doubt about an ID! However check the prices first if you use 3 or 4G in a Thai forest - where a decent phone connection seems to be more common than in the average Dutch dune! I think it's rather pushy to force already paying (!) customers to receive a newsletter. Leaving them a choice would be far more charming. To conclude, Lynx produced another good field guide that has a few nice little extras. Though personally I will also bring Robson along next time (eg for the quantity of plates) this book is a must-have for anyone visiting the area. It’s more than fair to say that none of the Lynx field guides have let us down so far. I have no clue where Lynx is working on right now, but I can think of two major birding destinations that really are in need of a (new) guide: China and Brazil. Given the diversity, number of threatened species and pressure on those species, these destinations also seem to be interesting for BirdLife. Lekagul, B & Round, P D 1991. A guide to the birds of Thailand. Bangkok. Robson, C. 2001. 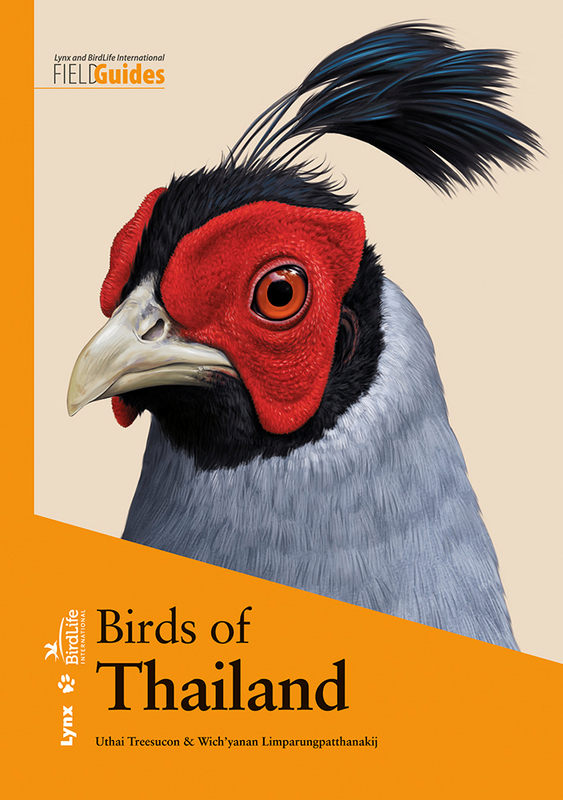 A field guide to the birds of Thailand. Helm Field Guides, London. Inderdaad, het alleen uitprinten van de platen die op hbw.com staan, zorgt dat er weinig toegevoegde waarde aan het boek zit, behalve dat het in boekvorm altijd lekker bladert en zoekt. Had gehoopt op extra platen/kleden, helaas, een gemiste kans om een goede additionele toevoeging aan je boekenkast of reisgezelschap te zijn. Dat gebrek aan kleden is ook mijn bezwaar bij Birds of the Indonesian Archipelago. Goede platen over het algemeen, maar wel enigszins goedkoop herkauwen van de platen uit HBW op deze manier. Desondanks is dit voor Thailand (en Indonesië) natuurlijk een must have! Ik snap niet waarom in deze gids juveniele/onvolwassen kleden ontbreken, terwijl deze veelal wel bekend zijn (Zie bv Robson). Een gemiste kans om het standaardwerk te zijn voor de komende jaren. Waarschijnlijk een commerciele keuze (waar niks mis mee is). The absence (or in a later edition: bad location) of maps in Robson's book remains highly annoying, as is the overcrowding on the plates. So an alternative for quick(er) reference is most welcome. (I think Argentina is in more need of a field guide than Brazil, which is manageable with Van Perlo + the compact South American Passerine guide).